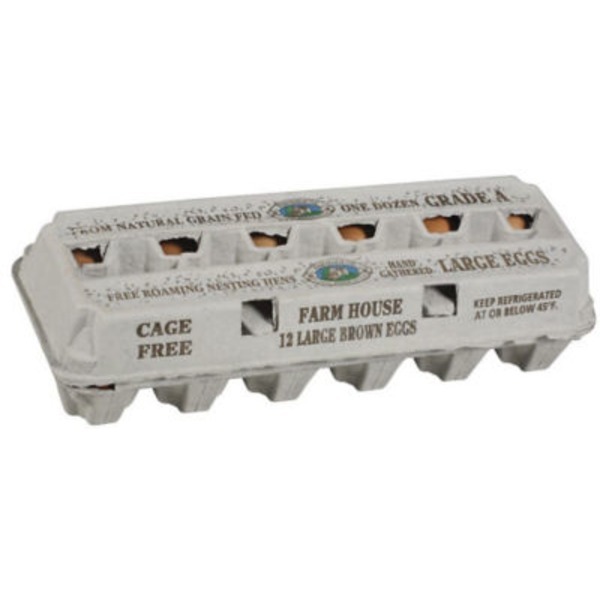 Farmhouse Cage Free eggs are brown eggs produced by hens in houses where they are free to roam. Our hens are provided ample room to roam, with areas dedicated to bathing and preening, roosting, with secure, comfortable nests. Farmhouse hens are fed an all-natural diet with no hormones or antibiotics added. Keep refrigerated at or below 45 degrees F. Safe Handling Instructions: To prevent illness from bacteria - keep eggs refrigerated, cook eggs until yolks are firm, and cook foods containing eggs thoroughly.